matt: whatyousay goes down like a short DHCP lease. adam: whatyousay: do you think I was being suggestive? whatyousay: think i just got trolled by adam. ben: whatyousay is the coolest office pet ever. whatyousay: is the reason i started programming, sad as that is. 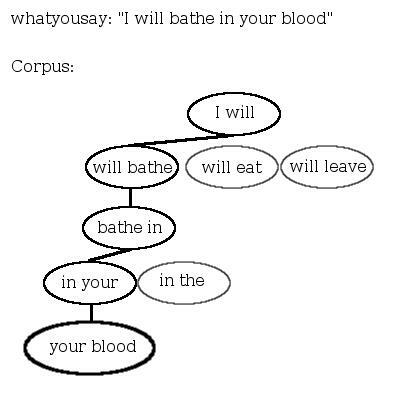 As sentences are added to the corpus, the number of branches at each step grows. The program only needs a single "key" to start with, and it can then follow branches randomly until it reaches a dead end, building up a new sentence along the way. So how is this data structured in our code? We'll skip the Redis implementation details for now, and instead think of the bot's corpus as a big python dictionary. A new phrase pops up in the IRC channel -- what happens? ('this', 'is'): ['a', 'something'], # <-- added "something"
We could now generate a sentence like "but this is a test" by randomly following from one word to another assuming we started with "but this". Redis acts, in many ways, like a big python dictionary that can store several types of useful data structures. For our purposes, we will use the set data type. The top-level keyspace will contain our "keys", which will be encoded links in our markov chain. At each key there will be a set of words that have followed the words encoded in the key. To generate "random" messages, we'll use the "SRANDMEMBER" command, which returns a random member from a set. All together, here is the code for the redis-backed markov bot. Thanks for reading, I hope you've enjoyed this post. This project has been a fun one for me and my coworkers. Feel free to submit any suggestions/corrections/etc in the comment section!